I have ran my fair share of races over the past year. I've collected bibs, medals and glassware. Some were more organized than others but most were a ton of fun. After this weekend at The Color Run in St. Pete, I didn't get a medal, but I got covered in paint. It was an absolute blast and I will never be able to look at another race the same. The Color Run's claim to fame is that it is the happiest race on earth and I couldn't agree more. It was also very organized and well put together. Saying I am impressed is putting it very lightly. 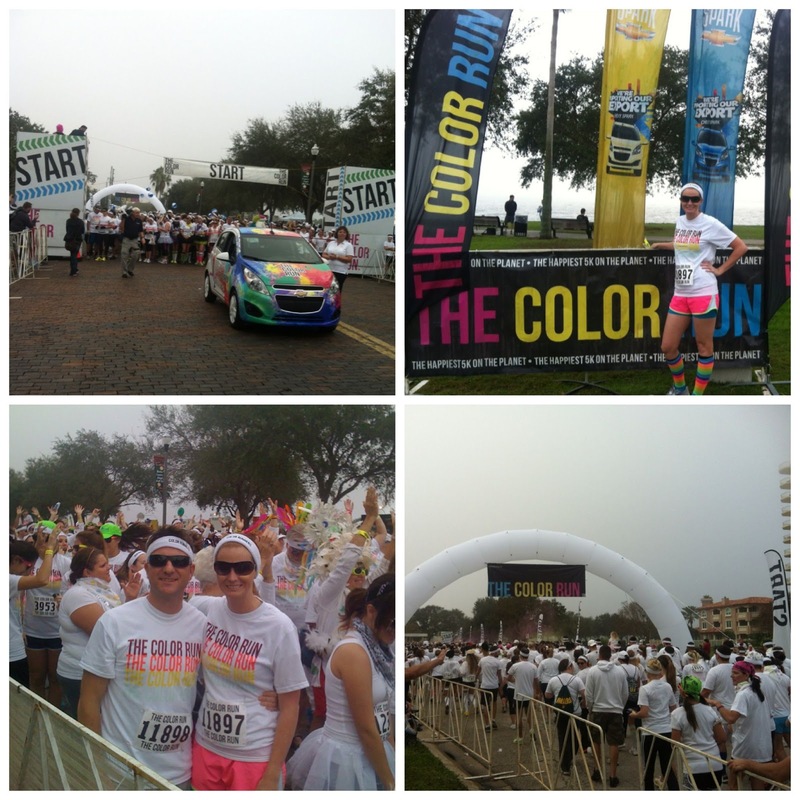 Hands clapping and two thumbs up for you Color Run. We started off the race with 12,000 other Color Runners, dressed in white. 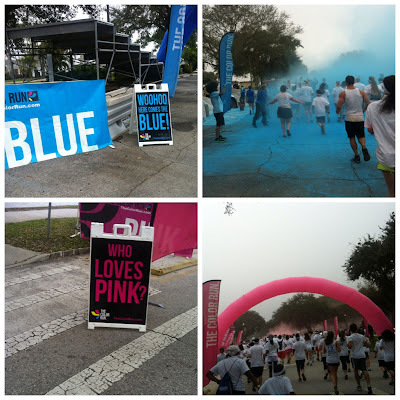 A few of my friends were also at The Color Run but I was unable to meet up with them. 12,000 Color Runners is a lot of people and we should have made a dedicated meeting spot (note for those running this in other cities with others). At the start of the race, there were white shirts everywhere you looked. So many people dressed up too which you know made me very happy! 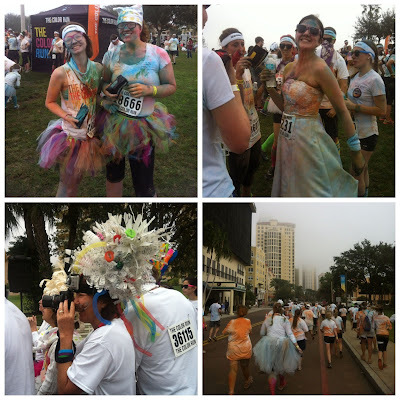 I saw tutu's, white graduation gowns, colorful socks and I even saw a few wedding dresses. I knew instantly this was going to be a blast. The first color we hit was pink. I was very unsure of what we were going to experience and didn't grab a decent action shot. I knew better when we came around to blue. Note, I had my phone in an otter box and an arm band to protect it from the paint. After the blue stop, I no longer could see anything on my screen since my otter box was covered in paint (which washed off). I didn't have my GPS, there were not mile markers and we didn't have watches. I had no sense of time and decided to take a walk break during the first water stop. Since this was a a fun run, timing devices were not involved and I would say about 80% of the 12,000 people were walking. The orange station appeared right after the water break and it was skinnier than the others. It almost felt like we were a herd of cattle getting ready to be painted orange rather than branded. Once we got through orange, we were literally in the streets of Downtown St. Pete. I am sure 12,000 people covered in paint is a site to see. 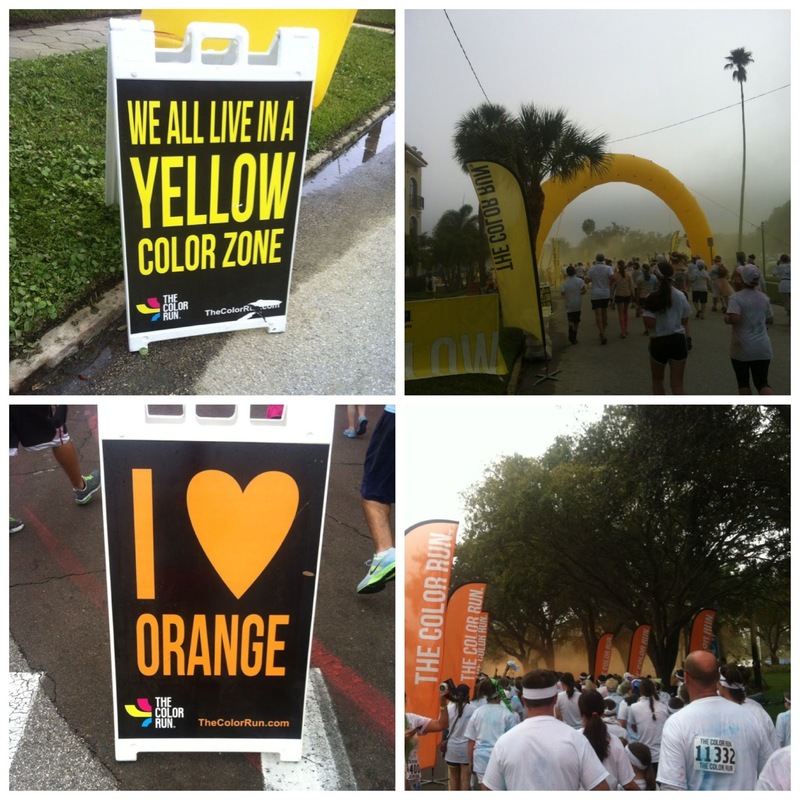 Yellow was close to the finish line and by that time, everyone was covered head to toe in various colors of paint. 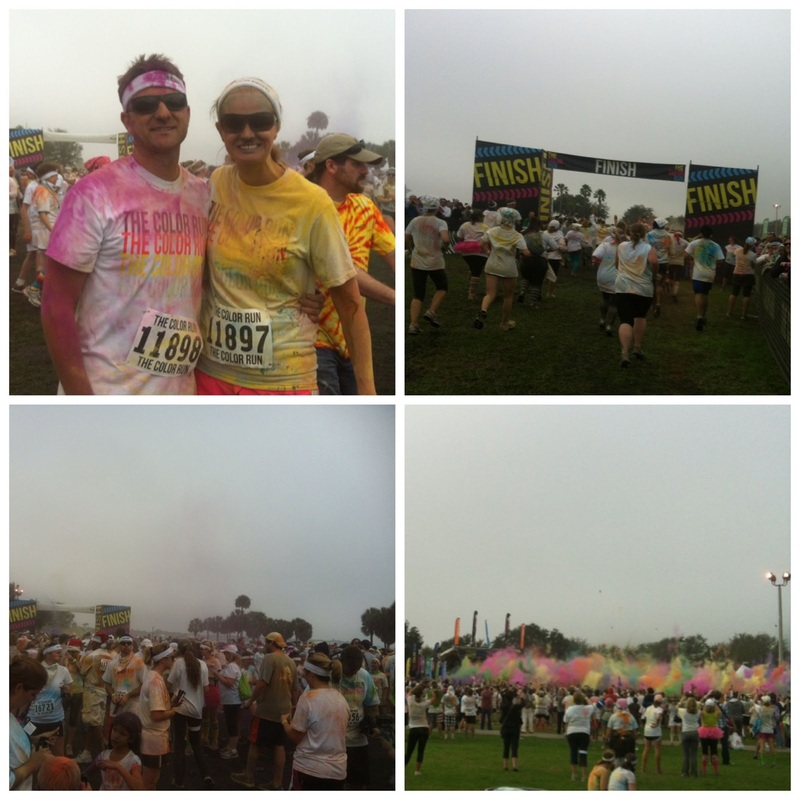 As we neared the finish line, all you could see was clouds of paint shooting into the air from a distance nearby. At package pick up, we received a small bag of dry paint. We were encouraged to save the paint for the end. 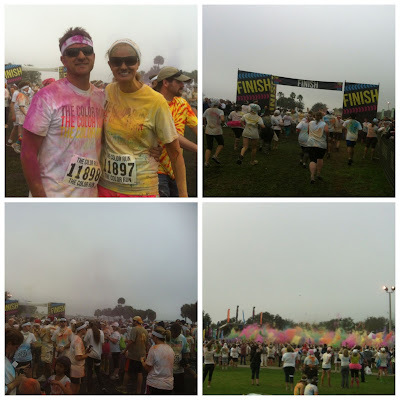 I turned to my loving boyfriend as we crossed the finish line to only find yellow paint dumped on my head. Thanks Babe. I turned around and covered him with my fuchsia paint. Then random strangers were coming up asking me to put my pretty purple paint on them. What we didn't know was that paint was to be used at the after party where thousands of people released their paint at one time (see bottom left photo). It was beautiful!!! 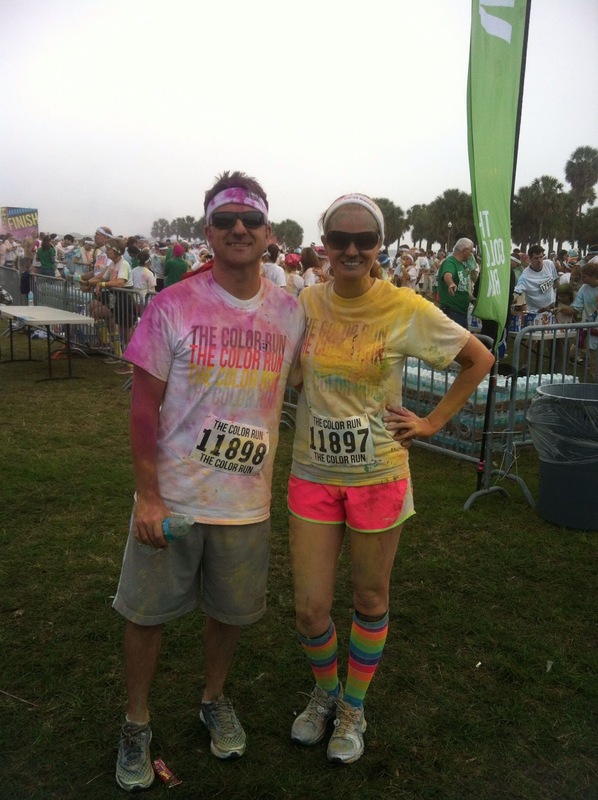 After the race, we were able to get the majority of the color blown off of us. This was a good thing being Gabe graduated that night with his Masters in Mental Health. I will give a piece of advice to those running it, try your hardest not to get wet. If you get the dry paint wet, it is harder to remove. The Color Run paint is easy to remove though. We used sugar scrub for those spots that were being stubborn. I asked Santa for the new Lite Brite Asics Nimbus 14. 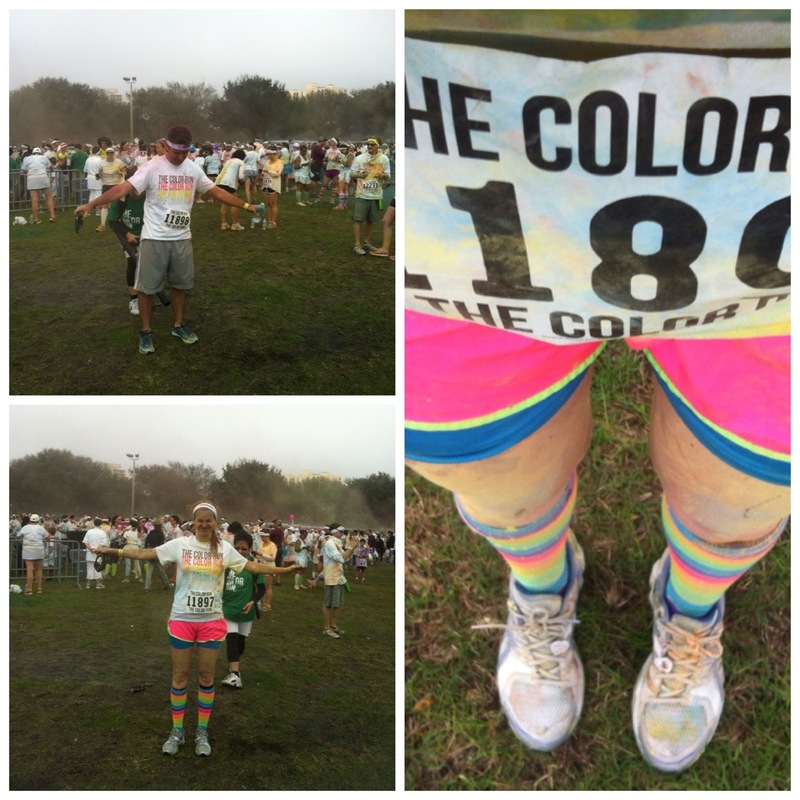 My current shoes must feel a little jealous as they took on the colors of the rainbow! The next stop on the tour is Color Run Orlando on January 13th! Cute post...love all the pics! That's so cool how the paint is all removed for you at the end! I will be doing this run next year!